The perfect bullet should expand soon after entering and retain a mushroom shape throughout the entire animal. Most hunters pay little regard to bullet selection, focusing instead on greater muzzle velocities, how awesome the loaded round appears, the name on the rifle, etc. But it’s the bullet that kills game. Few accept the fact that a hunt’s final results rest on a few cents worth of lead and gilding metal. The illustrations that follow represent deer-sized game and are shaded to show the damaged areas. This represents a typical mass produced work hardened bullet. The jacket fractures and peels back like a banana, then flattens against the shank. 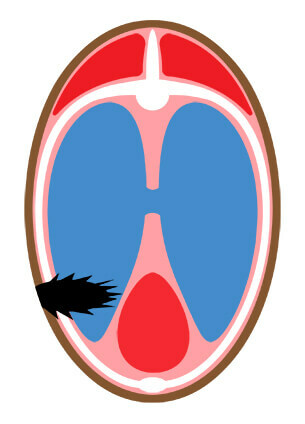 In the process, the exposed core breaks up and is flung off the rotating bullet. Only ±60% remains to drive deep within the animal. This bullet is commonly recovered just under the hide on the far side. If it exits, the opening won’t help facilitate tracking as the bullet’s retained expansion is minimal. 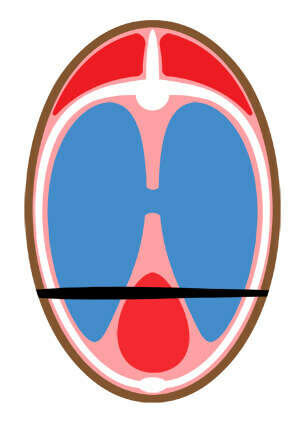 Our illustrations show an ideal broadside shot. Should the animal be quartering away, the bullet must drive through a lot more muscle bone, and paunch before reaching vital organs. It takes a proficient and persistent hunter to recover game with this type of damage. Here we see a bullet that is completely expended as its jacket and core fragments fly in all directions. With the shot placement in our illustration, the game would most likely be recovered without much trouble, but again if the animal were quartering away, it could continue several days before succumbing to the injury. This bullet could be a lighter one pushed at extreme velocities. This illustrates the same bullet as above at a much lower velocity or longer range. The velocity is not enough to ensure adequate expansion or extend much shock damage beyond the bullet’s cutting path. Jacket/core separation on impact is a total bullet failure. Much energy is lost where the core breaks free and pulls away from the partially expanded jacket. 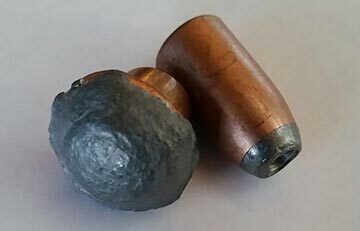 This is more problematic among boattail bullets. 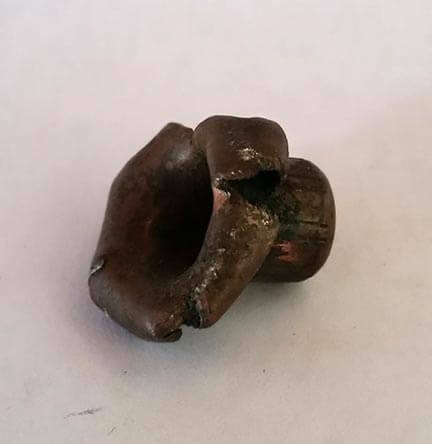 This bullet is either a non-expanding solid or a jacketed bullet that failed to expand. Distance may have been entirely too long. As its velocity drops, the small hydro-shock area will diminish eventually to the bullet’s diameter, similar to that of an arrow passing through which has no hydro-shock. This illustrates the Hawk Precision bullet. Its "soft"™ jacket expands, stretches back, and the pure lead core flows with it forming a perfect mushroom, expanding 2-3 times its original diameter, sending hydro-shock well beyond the cutting path, damaging 5 or more times as much tissue with internal hemorrhaging. High weight retention insures a through and through shot, leaving large exit holes that bleed freely. This is the kind of bullet that is capable of traveling end to end to destroy the vitals and handily put game down. Elk size game illustrating the anticipated wound channel from a "soft" Hawk Bullet. Expect heavy blood loss on the near and far sides making recovery easy. Game will go into shock soon after impact and shut down motoring skills in an attempt to preserve life. This jacket slipped it's core right after impact. Without it, the lead made a much smaller cutting path during the rest of it's forward travel.